Any Texas foot doctor worth his weight will advise you that physical activity is instrumental in contributing to your overall health. Running may seem like a simple and straightforward activity—put one foot in front of the other, quicker is better—but it’s not quite that easy. We have beginning runner tips for you, so that you can engage in this activity in a safe and sustainable manner that will help you achieve your goals and lead to a healthier lifestyle. Improved circulation. Your lower limbs need a healthy blood flow to receive nourishment, and exercise promotes strong circulation. Cardiovascular exercises like running get your heart pumping blood throughout your body. Limber muscles. A common source of injury in the lower limbs is excessive strain on tendons. Tendons are connective tissues that attach muscles to bones. When muscles are tight, they tug on the tendons and can lead to tendonitis. A regular running program can help to keep your muscles loose and reduce the strain on connective tissues. Stronger bones. Stress fractures develop when bones are fatigued easily. These hairline cracks in the surface of bone tissue are less likely to occur when bones are stronger. One of the benefits of a regular running program is increased strength in bone tissue. When you’re ready to start, the first tip for a beginner is to establish your goals and milestones for your running program. Think about what you want to accomplish. Perhaps you would like to run a marathon. Maybe you are interested in losing weight and improving your cardiovascular conditioning. Once you have your idea in mind, write down your goals and post them where you can see them on a daily basis. In order to create a solid goal, follow the SMART method. Make sure that your running goals are: Specific, Measurable, Attainable, Realistic, and Timely. A vague goal that cannot be measured will not allow you to know if you are making progress. You need to know exactly what you want to achieve, be able to see progress, and know that it can be achieved in a realistic, timely manner. Goals are important, but so are milestones. By creating these markers along your path, you will be able to see progress and know that you are getting somewhere. This ties in with the “M” from the SMART method and will provide the metrics you need to proceed. We hope that your plans and milestones do not include running a marathon in your first week! Part of being realistic in your planning is ensuring that you do not attempt to do too much, too soon. Plan on building up your levels of frequency, duration, and intensity gradually. Tackling too much at the start will only increase your risk of injury (like stress fractures, plantar fasciitis, Achilles tendinitis, etc.) and burnout. Now that you know what you want to accomplish and have a roadmap for how to get there, you will need the right equipment. Fortunately, running doesn’t require much, but what it does—shoes and clothing—is extremely important. Bring your running socks with you. When you buy shoes, athletic or otherwise, you should always make sure you bring the socks you plan on wearing with the shoes. Dress socks are generally thinner than running socks (which have more cushioning), and this affects the fit of the shoes. Go to a store that caters to runners. Going to a non-specialized store for running shoes is a lot like taking your car to a “quick service oil change” place for extensive brake work. Sure, it’s possible to come across someone who is knowledgeable and actually able to help, but the odds aren’t too great. In the same way, you’re better off going to a full-service mechanic in the first place, buy your running shoes at a store where employees actually know which shoes will work best for your unique feet and pronation pattern. Go shopping later in the day. Everyone knows “the early bird gets the worm,” but the early bird shouldn’t go shopping for shoes right after getting that worm. You probably don’t realize this, but your feet swell during the course of the day. As such, they’re bigger at night. You need shoes that fit well—not too tight—during all hours, so buy your running footwear later in the day. Find shoe models that work with your particular pronation style. Generally, there are three different pronation patterns – normal, overpronation, and supination. These relate to how much (or little) your foot rotates during the ground portion of a step. Shoe manufacturers develop specific kinds of shoes that are best for each pronation style. In the case of a normal pronation, you can wear a wide variety of styles. Overpronators need shoes that offer motion-control features for enhanced stability. Under-pronators need extra cushioning in their footwear. Not sure which pronation pattern you have? We can help! Come see us and we will identify your style and provide specific running shoe recommendations for you. Try them on. Running shoes should fit comfortably when laced tightly – they should not be so tight your toes don’t have room to wiggle. At the same time, too loose is also a problem. When running shoes are too big, feet can slide around inside when you run. Make sure your orthotics fit. Orthotics are customized to your feet, so we know they fit in that regard, but make sure your running shoes have room for them (if you have some). These valuable medical devices are intended to improve your foot function and keep you safe from serious issues, so you should always use them when running. It’s a problem if your shoes are too tight with your orthotics in or too small to accommodate them. As a general rule, you should replace running shoes every 300-500 miles, but this constitutes quite a range and there are considerations to be factored. In addition to a mileage range, which at least provides a starting point, it is important to study your footwear and listen to your body. A key indicator of wear-and-tear on running shoes is the outsole. The rubber outsole makes contact with the ground and its tread wears away over time. A less visible indicator of worn out running shoes is the feeling of “flatness” from the midsole as it breaks down. This means the footwear doesn’t have the same “bounce” it previously had. Warm up and stretch – Hitting the road or trails with “cold” muscles is a risky endeavor. Take the time to warm up with a five-minute walk or light jog and lower your risk of soft tissue injury. Think of this step as “dynamic” stretching, which is more effective prior to starting an activity than “static” stretching (performing a stretch and then holding it). Ease into running – One of the beginning runner tips that will help you to avoid becoming easily discouraged is to start out with a run/walk mix, instead of jumping right into full, all-out running. A good plan to get you started is to use a 1-minute run/5-minute walk interval and repeat it five times through to provide a solid 30-minute workout. Over the course of the next couple of months, gradually increase the amount of time you run, while decreasing the walking portion of the mix. You will then be able to run for 30 minutes without needing the walking component. Hydrate – Drink plenty of water to avoid cramping in your lower limbs! Eat well – Providing the right nutrients for your bone and muscles will help keep your feet and ankles strong as you log the miles. Bone health is important for reducing your risk of stress fractures. Don’t push through pain – Long-distance running isn’t particularly comfortable no matter how you do it, but any sharp or chronic pain is a cause for concern. 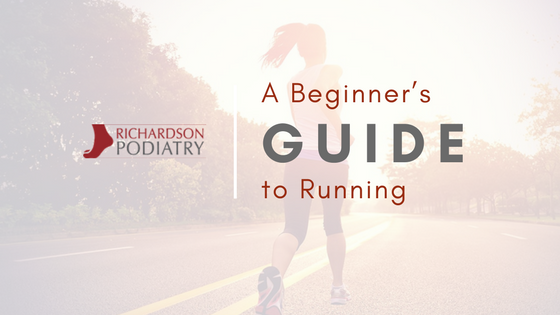 Whether you want additional beginning runner tips or require care for a foot or ankle condition, Richardson Podiatry Center has the expertise and knowledge to help your running journey. We offer running tips so that you can stay safe, but any physical activity comes with the risk of injury. If you experience pain, we can help! Contact us and schedule an appointment at our Richardson, TX office by calling (972) 690-5374.